Place 5 bets of £10+, and Betfair will give you a £20 free bet each time when you visit via My Betting Sites. Terms & Conditions: New customer offer. Place 5 x £10 or more bets to receive £20 in free bets. Repeat up to 5 times to receive maximum £100 bonus. Min odds 1/2 (1.5). Exchange bets excluded. T&Cs apply. What Does This Betfair Promo Code Get You? By using the Betfair promo code above, you will receive their latest welcome offer – the ability to receive up to £100 in Free Bets. Where Do You Enter the Betfair Promo Code? 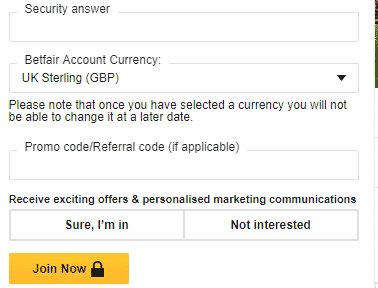 You must enter the promo code while registering for Betfair. It is in the second section of the registration process, just before the final stage of clicking ‘Join Now’. Do You Need a Promo Code to Get the Welcome Offer? Yes. With some bookmakers, the promo code doesn’t really exist to do anything. However, you will need to enter the promo code to receive the offer with Betfair. If you’re considering joining Betfair, take a look through some of the points below. Part of the Same Group as Paddy Power – If you join Betfair, you’ll know that your deposits and withdrawals are safe as you’re dealing with a very large company. Betfair is part of the same company as Paddy Power and is the betting partner of both Arsenal and Barcelona. 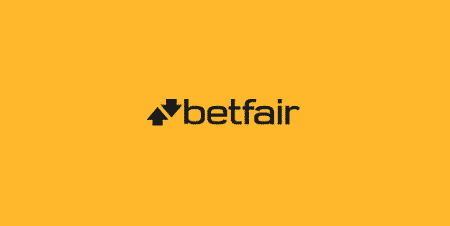 Large Welcome Offer – Betfair offers one of the largest bonuses for new customers. For those who don’t already have an account, this makes it a good time to join. Access Their Betting Exchange– Betfair gained their large market share and fame from introducing the betting exchange concept. They’re still the largest, providing you with the greatest liquidity. We monitor offers for existing customers on a daily basis, so we know this area better than anyone else. It’s great picking up your welcome offer when you join, but equally, it’s good to know how likely you are to receive offers as an existing customer too. Here are some of the most popular offers Betfair ran in the previous month of March. They’re for the sportsbook offering, rather than the exchange. Back a winner and get a free bet – Betfair for televised races on ITV will give you a free bet when you back a winner. It’s usually a max of £25 free bet, but for Cheltenham, they increased it to £50. Six Nations – Betfair were only of only two bookmakers that had offers for every round of the Six Nations. They included getting money back if your first #OddsOnThat bet lost, and free £5 acca bet when you bet £10 on the exchange.